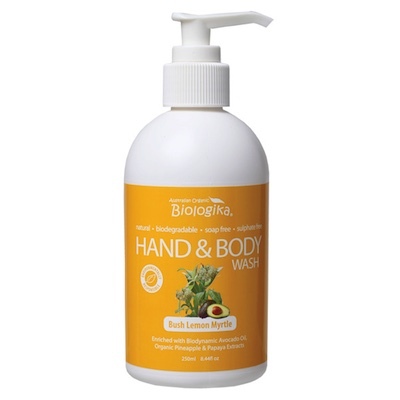 Hand & Body Wash Therapy range, Enriched with Biodynamic Avocado Oil, Organic Pineapple & Papaya Extracts. Available in 1lt, 500ml and 250ml with pump. Biodynamic Avocado Oil rich in Vitamin A has been added for its nourishing and superior emollient properties. - Organic Pineapple extract used for its purifying and refreshing effect and Organic Papaya known to be rich in vitamin C, a natural antioxidant. A gentle formula for everyone to Enjoy!! Ingredients: purified water, biodynamic avocado oil, decyl glucoside, organic pineapple extract, organic papaya extract, coconut oil, organic aloe vera extract, xanthan gum, organic lemon myrtle pure essential oil, olive leaf extract, potassium sorbate and citrus seed extract.